When deciduous trees shed their foliage in the autumn season and carpet the forest floor, the leaves slowly decompose and release nutrients back into the earth. In the natural environment, this cycle protects soil from drying out while providing a moist growing medium for young plants and seedlings come spring. Leaf mold, also often referred to as leaf mulch, is a form of compost composed entirely of shade tree leaves. When moist leaves are left to decompose over time, it results in a dark brown to black humus with a crumbly texture and earthy aroma. A garden is only as good as its soil. The ideal soil type is loam, which is composed of equal parts sand and silt with lesser amounts of clay. Loam soil has a loose and crumbly texture that allows water and air to flow through it. Because it’s porous, loamy soil won’t become compacted, allowing water to drain so your plants won’t become waterlogged. Having a good soil tilth also means plants will easily be able to take in nutrients. Leaf mold is a wonderful soil fixer. No matter whether your existing soil leans toward clay or sand, leaf mold will help improve soil structure all around. When added to dense clay soils, it loosens it up and prevents it from compacting after a hard rainfall. For loose sandy soils, leaf mold makes it more cohesive, preventing soil from eroding while it holds on to moisture. During periods of high heat and little rainfall, keeping your garden beds well watered can be a Sisyphean task. But when leaf mold is tilled into the soil or set on top of the soil surface as a mulch, it significantly improves the soil’s water holding capacity. Although leaf mold is often said to be mostly devoid of nutrients that keep plants growing strong, analysis of the chemical composition of leaf litter reveals that it supplies small amounts of several important elements. Leaf samples from red maple, red oak, sugar maple, sweet gum, sycamore, pin oak, and Norway maple trees contained a varying range of carbon, nitrogen, potassium, phosphorous, calcium, magnesium, boron, iron, copper, zinc, sulfur, sodium, manganese, nickel, and chlorine. Though this blend of nutrients will provide a boost of growth in early spring, it’s recommended that you apply 25% more fertilizer in late June to keep garden plants happy. Another benefit of applying leaf mold to the soil is its impact on food-bearing plants. Because leaf mold improves soil conditions, it allows root systems to flourish which, in turn, boosts nutrient uptake for larger fruit and vegetable yields. A study published in Compost Science & Utilization compared the effects on onions grown in soil amended with leaf mold with an unamended plot over the course of three years. The leaf mold group of onions were consistently larger in size and yielded a considerably higher volume at harvest time than the control group. As an added bonus, leaf mold also reduced the susceptibility of onions to soft rot disease. Aside from the practical reasons to make leaf mold, it is also an environmentally friendly way to recycle yard waste. 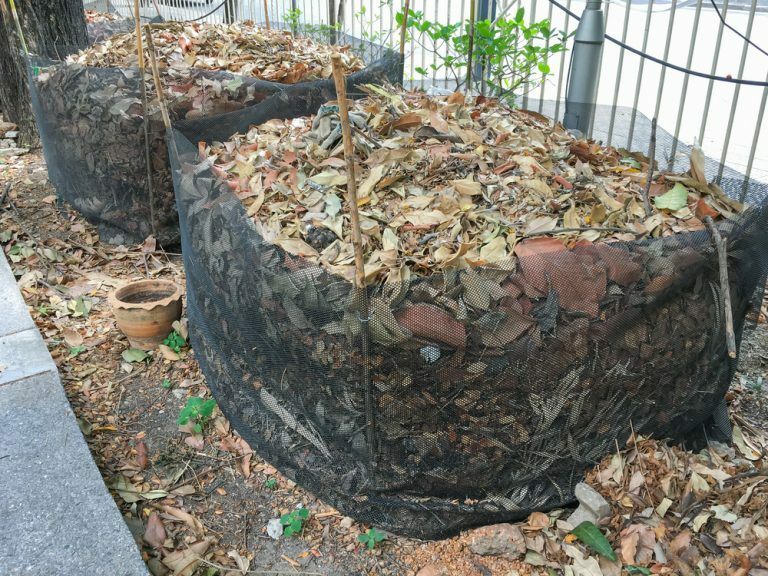 When tree leaves, grass clippings, tree branches, and other outdoor debris are sent to a landfill, they are entombed in an airless environment. Instead of generating compost, these otherwise clean and biodegradable materials emit carbon dioxide and methane gas – both of which are major contributors to global warming. If the landfill facility doesn’t tightly control these emissions, they are released into the atmosphere and seep into the surrounding land. Unfortunately, only 25 of 50 states in the US have an outright ban on landfilling yard waste. But you can do your part to lessen your carbon footprint by transforming tree leaf waste into a valuable, renewable resource. Unlike traditional compost that is created with heat and bacteria, leaf mold is a slower process accomplished in cooler weather via fungal decomposition. Collect fallen leaves that are bountiful in autumn and pile them in a shaded corner of your backyard or keep it contained using wire fencing. The pile should be at least three cubic feet large. Once the leaves are piled, dampen it thoroughly. Check moisture levels every so often and water again if it begins to dry out. If you don’t have the space for a large leaf pile, another option is to place leaves into a garbage bag. Moisten well, seal the bag, and poke holes along the sides to allow airflow. Check moisture levels every couple months. Cut ‘Em Up –Before adding leaves to the pile, shred them into smaller bits by running a lawnmower over them and then raking them up. You can also invest in a leaf shredder or leaf vacuum with a shredding function. Turn the Pile – Increase airflow by turning the pile with a pitchfork every few weeks. If you’re using a garbage bag, give it a good shake. Cover the Pile – Trap moisture and warmth within your outdoor pile by covering it with a tarp. You’ll know your leaf mold is ready to use when it is brown and soft and crumbles in your hands. Till it into your garden beds and use it as mulch for perennials, trees, and shrubs up to three inches deep. It’s also a great peat moss substitute when mixing your own potting soils for indoor plants and container gardens. So if you have two (or 20) trees to clean up after this fall, it’s well worth your while to put this free and abundant resource to good use! If you want to find more gardening How-to’s, as well as tons of proven natural remedies, take a look at the Everyday Roots Book! With 350+ pages, you will be able to replace all of the toxic products and medications in your home and garden with healthier, all-natural alternatives. In this amazing book you will find eco-friendly, creatively frugal gardening tutorials, remedies & tips as well! You will be confident in knowing exactly what is in the products your family uses and happy with the money you will save every month.